You may love franchising, but if you want to own and run one, it's crucial you get the right fit. 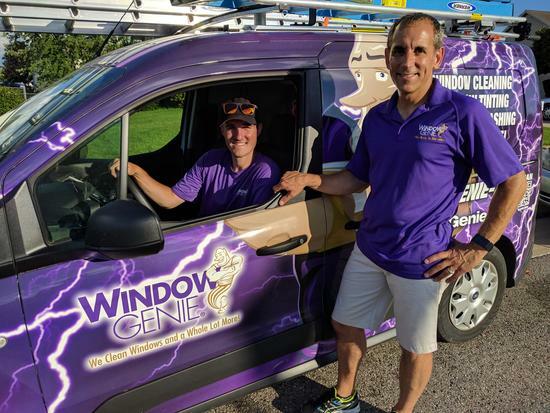 This is what Ron Kuhn discovered before purchasing his Window Genie franchise this past June. Ron Kuhn spent many years running a process improvement and efficiency consulting company along with a partner. He and son Alex will now serve the Grand Rapids, Michigan community with residential and light commercial window cleaning, window tinting, pressure washing, gutter cleaning and more. "While running my consultancy business I realized I liked being my own boss," said Kuhn, "so I also invested in a Quiznos Subs franchise during those years. Running the sub shop, and my consulting business, gave me the variety and challenges that kept things interesting," Kuhn shared. However, when his consulting company partner moved on in 2008, Kuhn took on more responsibility to keep the operations consulting business going. He decided to focus on that and sold the Quiznos franchise in 2009. "When I decided to re-enter the franchise community," continued Kuhn, "it was clear I needed to find the best fit. I wanted to shop around for another franchise that was better suited to my lifestyle and my plan to include my son Alex in the business. Some of my fondest memories, even when times were tough, were of taking Alex to my Quiznos shop at ages five through eight! He loved it. He would go with me to the store and help with anything he could. He would wipe tables, put away stock, make sandwiches and ring up customers. I think learning structure at that young age was very good for him so now we are working together in our Window Genie franchise while Alex takes college courses. After we went to Window Genie's corporate office in Cincinnati for training, we knew this was a much better "franchise fit" for us and figured out how we would do this as a team. We both loved the corporate culture of the company. The feeling is very inclusive and that nobody is in this alone. That's perfect because it is hard for me to be everywhere; so, Alex is helping me train new technicians, quote cleaning jobs, answer phones, and overall be another set of hands whenever I need him. Two heads are always better than one, and the two of us have mastered this. We think, work, and collaborate as a team and I believe that this will truly help us be a success." Founded in 1994 by Richard Nonelle, Cincinnati-based Window Genie is a national home service franchise specializing in residential and light commercial window cleaning, window tinting, pressure washing and gutter cleaning. Additional services in select markets include gutter re-securing, roof washing, solar panel cleaning, holiday light instillation, dryer vent cleaning and more, visit www.windowgenie.com. Window Genie currently operates with over 100 locations in 29 states. Window Genie is a subsidiary company of Dwyer Group®, a service based franchise organization. Target markets for growth include New York, California and Florida. This page is an archive of recent entries in the Window Genie category. Wild Birds Unlimited is the previous category. Young Chef's Academy is the next category.